The health and beauty care sector is one of the booming sectors in the world and presents tremendous opportunities for marketers to explore expanded markets. 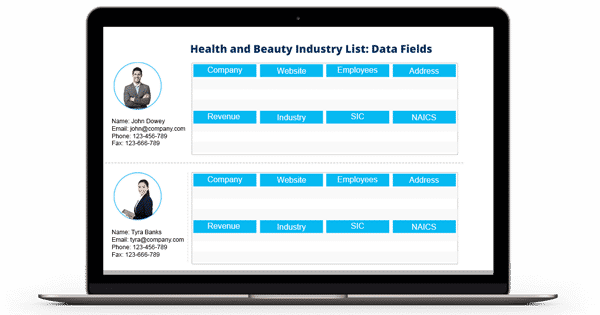 If you are a marketer who is in search for reliable and accurate database of key decision makers in the health and beauty industry, Blue Mail Media’s Health and Beauty Industry Mailing List can be the perfect strategic resource for your multi-channel marketing campaigns. Our database gives you complete access to information to reach out to your present and potential customers via telephone, email or mail. Blue Mail Media has a strong presence across different regions enabling you to expand your business beyond domestic borders. Our Health and Beauty Industry Email Database is designed to help you achieve a greater response rate, conversions, and ROI. We employ a highly motivated team of data scientists, marketing experts, and professionals who adhere to a well-defined process for data collection, verification and update and make sure that our database remains free of errors and delivers you great value. With Blue Mail Media, you can either choose from our pre-packaged mailing list of Health and Beauty professionals or you can get a customized list prepared based on your campaign specific requirements. Explore the competitive advantage of marketing intelligence with Blue Mail Media. Get New List Announcements, Special Offers & Industry News direct to you!